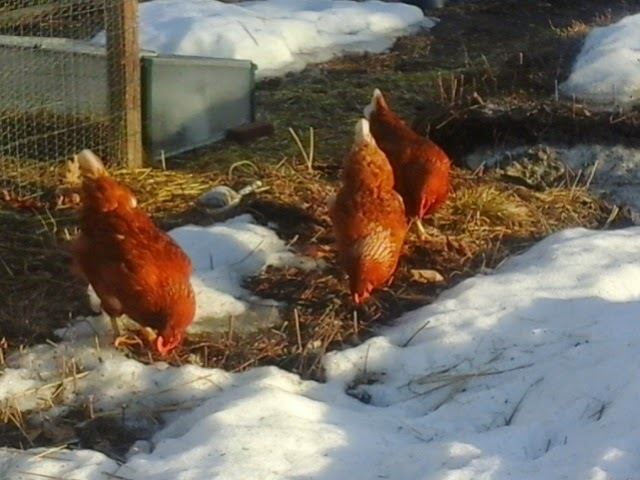 The girls in some newly thawed garden area. Eat all those weed seeds, girls! The last couple of days with above freezing temperatures have precipitated lots of thawing. I see bare patches of ground appearing here and there. The chickens are discovering little bits of green weeds poking up, or bits of weed seeds, and who knows what else? 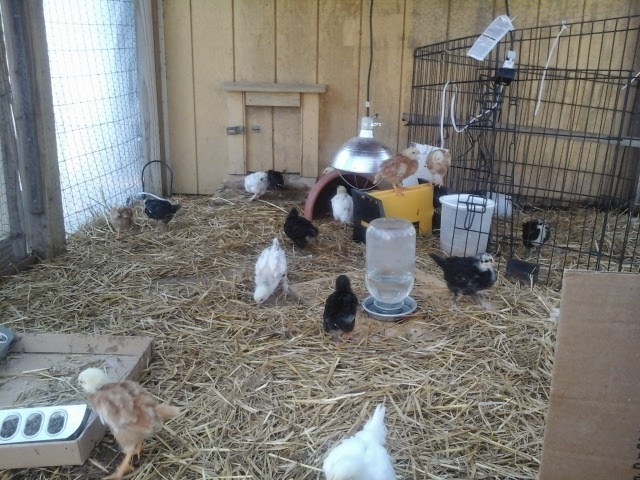 I can barely chase them into the coop at night, they are enjoying their expanded territory so much. The baby chicks did alright last night in the big coop with their heater. Even though it was only 22 last night, they seemed fine this morning. Better than me, probably, because I hardly slept worrying about them. When I released them into their "chicken greenhouse" it was only 33 in there, but quickly warmed up and they really didn't seem to mind. I have to move the heater units back and forth morning and night, between their nighttime crate and daytime run. 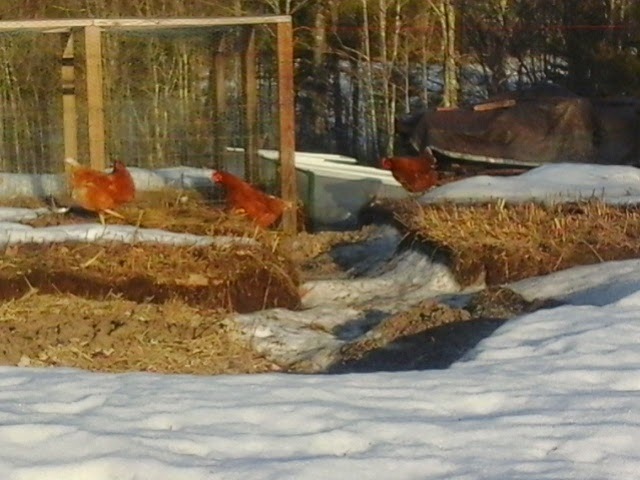 Pretty soon it will be warm enough that this won't be necessary, and they are so happy in their new expanded living quarters, that I won't mind the bit of extra work until things really warm up. 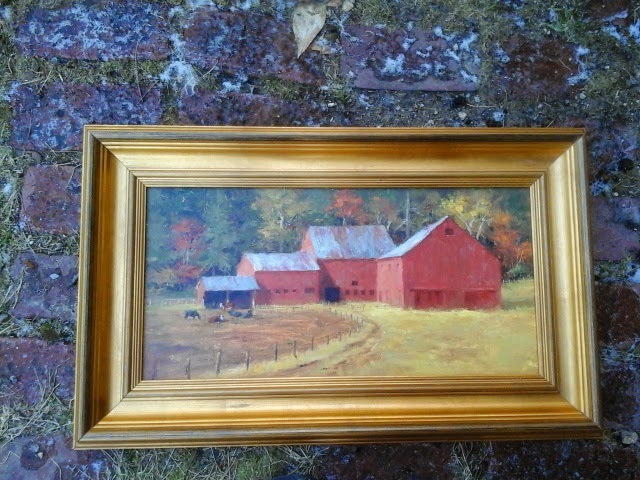 And, a totally unrelated bit of fun news.... Our plein air painting group has an exhibit in a beautiful old Inn up north in the mountains here. Our news channel did a story about the Inn, and one of my paintings showed up on TV, just in the background.. but it was still neat seeing it on TV.